Wake up from your slumber! The alarm is sounding! Be alert! Early this morning Prime Minister Ariel Sharon ordered the assassination of the blind muslim terrorist, Sheik Yassin. Shortly after sunrise, an Israeli helicopter fired 3 missles directly at the Sheik as he left the Mosque…there wasn’t much of him left to put in the coffin that the Palestinians carried around town as they shouted obscenities and threats against Israel. Sheik Yassin was the founder of the terrorist organization known as Hamas. Most recently, the Sheik is blamed for the deaths of almost 300 Israelis who were at the wrong place at the wrong time when the brain washed muslim homicide bombers pushed the button to detonate the bomb strapped to their chest. In light of the Sheik’s status, this particular assassination could very well be a new spark that ignites another powder keg of violence. You might not smell the smoke, but the fire is approaching. The hour has come for you to wake up from your slumber, because our salvation is nearer now than when we first believed. The night is nearly over; the day is almost here. So let us put aside the deeds of darkness and put on the armor of light. The church of Jesus Christ is largely sleeping, like a great bedroom and you have all the Christians in bed and they’re all sleeping … and they’re saying “Please, don’t wake me up! I want to sleep on!” And of course when God starts to operate a revival people cannot sleep, you can’t sleep in church when the Spirit of God awakes the people. Look at the 1st verse of this 52nd chapter (Isaiah 52) …”Awake! Awake! Put on strength!” Wake it up! You sleepy Christians! Awake thou that sleepeth, Arise from the dead! Christ will give you life! Much has been happening in the last few months. The decline of morality in our country seems to be accelerating, taking us all ever nearer to the edge of the cliff which leads to the depths of destruction. First of all, the liberal media is doing a fine job of promoting the growing trend of city mayors endorsing “Gay Marriage”. San Francisco, Los Angeles, Seattle, Portland Oregon and other large cities are deluged with homosexual couples who are going to city hall to get “married”…never mind that marriage has always been and always will be a covenant created by God between a man and a woman as a symbolic union of Jesus coming for His church, and for the purpose of procreation. The defiance of State Law by these mayors and other elected officials is not an act of civil disobedience, but a breech of contract for which they should be removed from office. They each took an oath to abide by the law and now they are defiantly breaking both their sworn oath and the law with no regard for the chaos that these unholy unions will lead to under the guise of “marriage”. Secondly, the Episcopal Church has officially installed the first openly gay Bishop in New Hampshire. Sunday night on 60 Minutes, V. Gene Robinson said during an interview that “God is doing something new” by allowing practicing homosexuals to hold positions of leadership in the church. All I can say is that his god is his appetite for sin, not the Holy God of the Bible. Thirdly, Mel Gibson’s movie ‘The Passion of the Christ’ is a blockbuster so far. In only two weeks time the movie has generated box office receipts of over $200 million showing Hollywood how much people really want to see movies which depict the Truth. Having seen the movie during it’s opening weekend I can say that yes it is incredibly intense and the depiction of the violence that Jesus was subject to is very real. I think all Christians should see it to sharpen their understanding of how high a price Jesus paid for our sins so that we might be with him in paradise one day. Many people see the movie as a “Last Call” before the Lord returns for His church, and it might be. 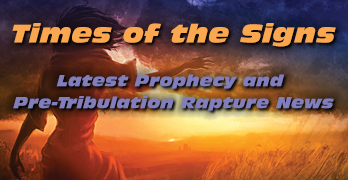 Certainly the day of the Rapture is one day closer than it was yesterday, and can happen at any moment, so we should all live our lives accordingly. Other noteworthy events of the last few months include the capture of Saddam Hussein on December 14, 2003. It was only a matter of time. This evil man’s world has come crashing down all around him and God ordained it be so. His sons were shot full of holes by US Troops and their ugly corpses were displayed on TV and the Internet for the world to see. Everything this tyrant had “control” of has been ripped away leaving a painful, ugly wound that will never heal. The capture or death of Osama bin Laden is just a matter of time as well. I pray that it happens sooner rather than later so that the fanatical Muslims who view Osama as a hero can see that the true Living God’s justice will always prevail over evil.